The Monthly Allowance Template is the perfect tool to create a budget for your luxury items each month. This free template will allow you to quickly go through and customize your document with your own favorite items. You’ll set a budget for yourself and update it each time you spend. This template will give you the necessary tools to finally reign in excess spending each month to save money on the things that really matter. Many people don’t even realize how much they spend on their trip to the salon or the cost of going to the movies each week. 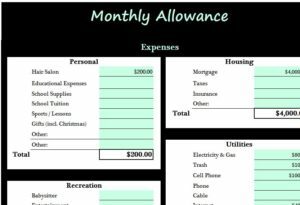 Use the Monthly Allowance Template to start saving money. The format of this template is simple and straightforward. You can see how your expenses are separated and are given their own tables to work on. The cells marked in green are the sections where you’ll enter your budget. You can also change any of the pre-written items by clicking the cell and writing something new. For example, let’s say you want to change the “School Supplies” section to “Car Repair”. You will simply click on the cell containing “School Supplies” and start writing your new category to change it. Start by going through the list and changing/deleting any categories that you don’t use frequently. Next, you will simply add new items for those categories to match. This way, you can go through and find items from a glance. Once you actually enter your budget for each item in a category, the template will provide you with a total for all the items in that category at the bottom of each table. When everything is said and done, scroll to the bottom of the page to see your overall monthly review. Here, you can enter your annual income and have it automatically calculate your weekly income. From there, the template illustrates your expenses versus your income to show your total savings. Have complete authority over what you spend each month by using the free Allowance Template.